1. 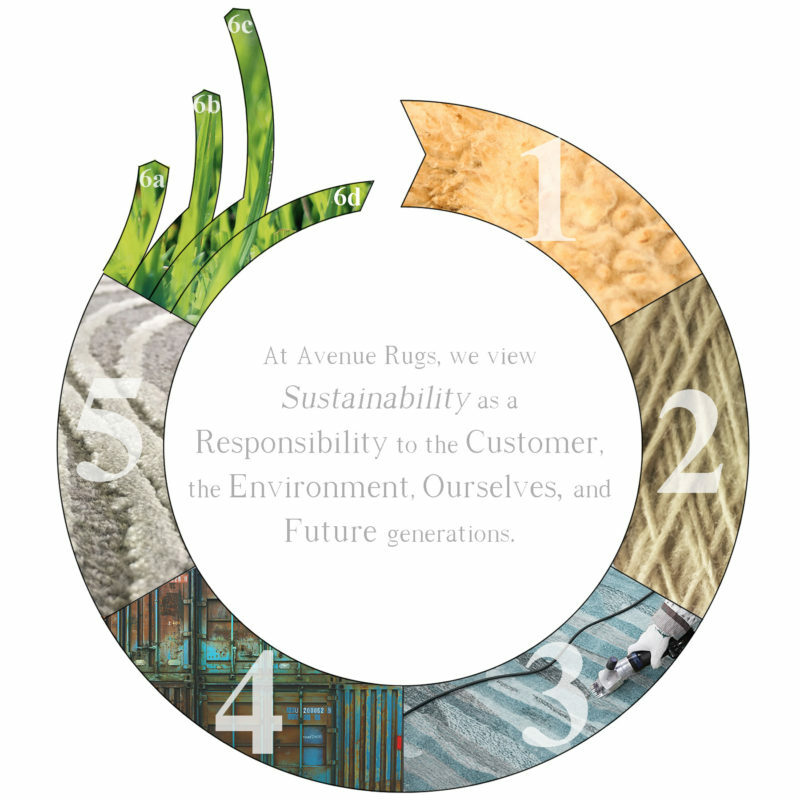 Extraction-From New Zealand sheep, China sheep, or silk, these rapidly renewable fibers are the essence of our rugs, each regenerative and compostable. 2. Processing-Once the wool has been sheared, it is cleaned, scoured, graded, sorted, and carded. 3. Manufacturing-The yarn is then dyed in proportion to the pattern in varying sizes of dye becks to reduce yarn and dye waste. After dyeing, the yarn is air dried rather than oven dried. Then, a skilled artisan hand tufts the yarn into a cotton backing which is coated with natural latex after tufting. 4. Transportation-Most of the raw material and finished product are moved by container sea freight and rail, which can have a smaller footprint than trucking in the continental US. Learn more about shipping methods and sustainability. 5. Maintenance-Natural wool yarn cleans best with less aggressive chemicals than synthetic rugs. Please refer to our maintenance recommendations for more information. a. Landfill-This is not the ideal option for disposal, but the rug will still decompose in the landfill as long as it is aerated. b. Down-Cycle-The rug can be processed into automobile acoustical insulation, packing material, and carpet padding. d. Compost-As the rug is made of natural materials, it will compost. This is the best data today and subject to change due to regulatory constraints and technology.